Fifth slams home with a thump. 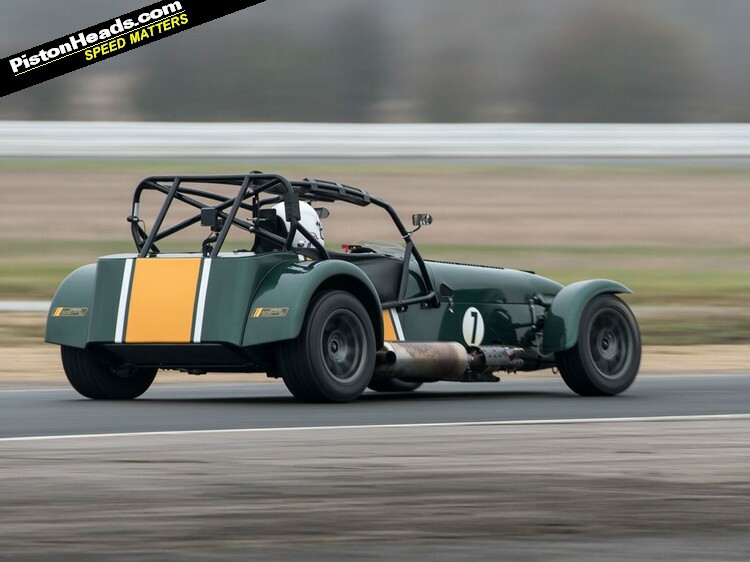 An icy blast of wintry Lincolnshire wind whips under my visor and with it the savage pop of a supercharged Duratec flat shifting through a sequential gearbox. 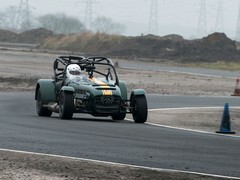 A relentless surge of power overwhelms what little grip the rear wheels had, demanding a hurried half turn of opposite lock. A hundred yards away, directly in my line of sight and current direction of travel, photographer Tom really, really hopes I've caught this one. Truth is the R600 on this Blyton track is actually less of a handful than the road tyred Supersport R provided beforehand for sighting laps. Which I end up spinning. Several times. 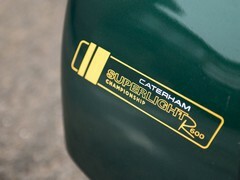 The Caterham guys later concede that it's been deliberately set up to be a little spiky, one suspects in the hope that'll cool any wannabe racing boots among the assembled hacks. It works. By the time I strap into the supercharged car I'm a bundle of nerves. But it immediately feels softer, friendlier and more predictable despite having another 100hp over the Supersport and some considerably stiffer springs. A quick re-cap though. 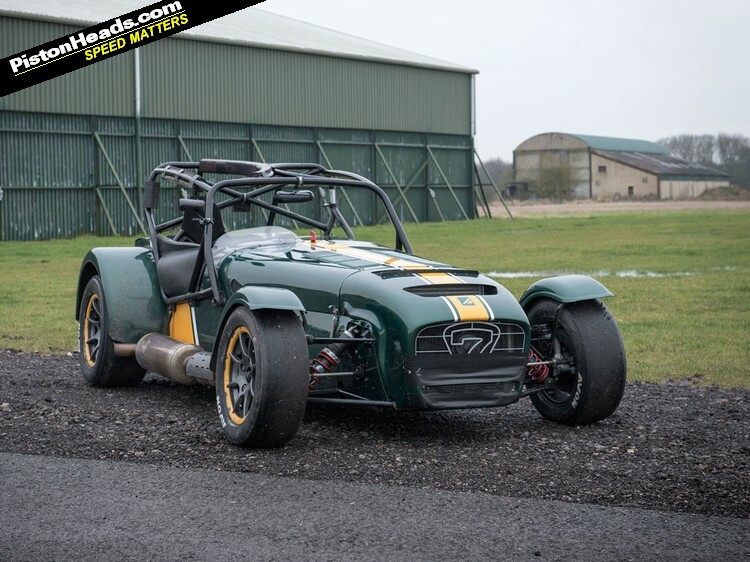 As resident 'ring man Dale Lomas discovered in a sneaky early shakedown Caterham has been working on a supercharged Seven for some time and revealed the finished product - the R600 - not long ago, the new super-Seven using the supercharged Duratec from the SP/300.R. In the R600 it runs standard cams and a 7,500rpm redline against the SP's push-to-pass enhanced 335hp and 7,800rpm, 275hp chosen as - cough - a sensible limit with durability in mind. Could it run the same as the SP? A sheepish grin from the engineers and "no reason why it couldn't." You'd have to be mad, obviously. 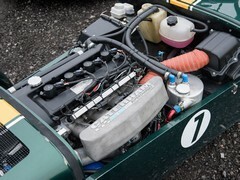 Like the SP/300.R, it drives through a sequential gearbox, in this case a Sadev unit rather than the (pneumatically shifted) Hewland in the SP or Quaife optionally available on the R500. This following consultation with race teams on their favoured transmission. That it's 8kg lighter than the Quaife helps too. 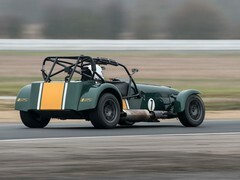 The rest of the package is basically as per the R300 race car, albeit with beefier two-pot AP calipers and vented discs on the rear axle, stiffer springs (350lb in against 250lb in) and revalved fixed rate Bilstein race dampers to cope with the greater loads going through the chassis. 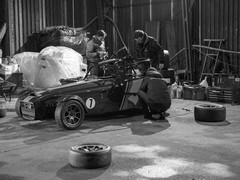 Adjustment is limited to ride height, anti-roll bars, toe and camber to prevent better funded teams with testing budgets having too much of an advantage over the plucky privateers. 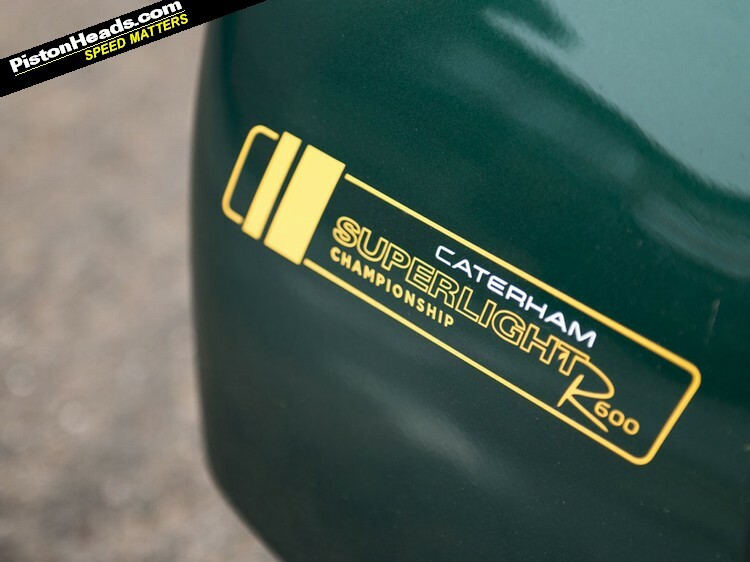 If you're used to the more explosive power delivery of recent lunatic Superlights the more elastic throttle response of the R600 comes as something of a surprise. Likewise the fact it seems to take half as long to arrive at corners than it did in the Supersport. 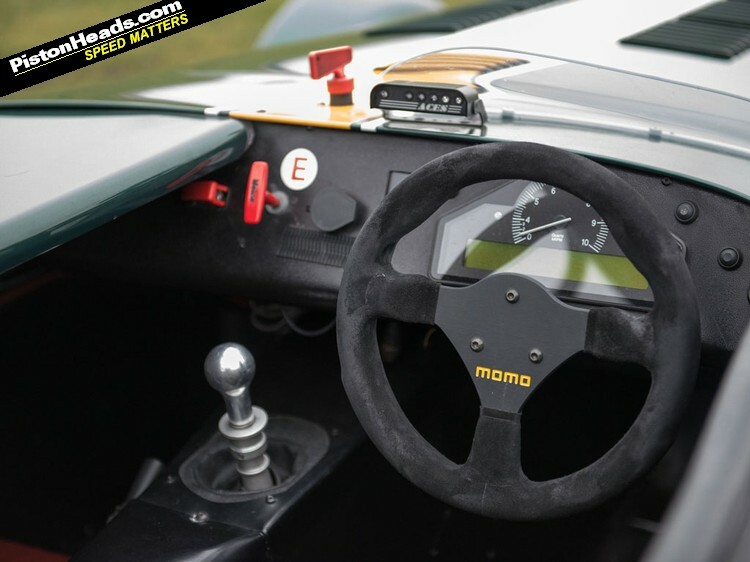 This requires a rapid reboot of reaction times, braking, shifting and steering input. 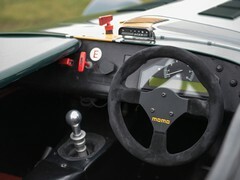 Lots of steering input. In all sorts of directions. 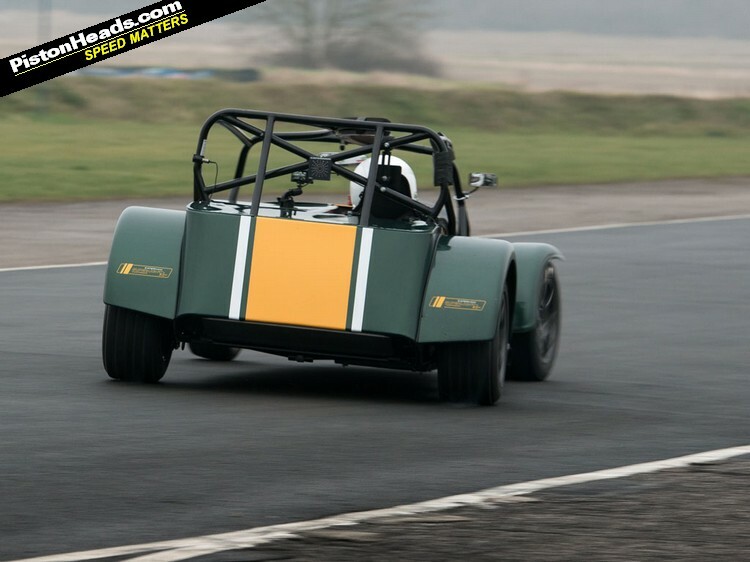 Strangely for all the frantic arm twirling and 'can I, can't I' throttle inputs the R600 carves an unwavering line through Blyton's corners and feels more benign than the Supersport, despite going a lot, lot faster. Even with all that camber on the front end to compensate for the sidewall flex in the race radials the front end still feels a little light, its role in direction changes secondary to that dictated by the rear axle in these conditions. The greasy surface means wide-open-throttle opportunities are limited but when they occur it's just insane. 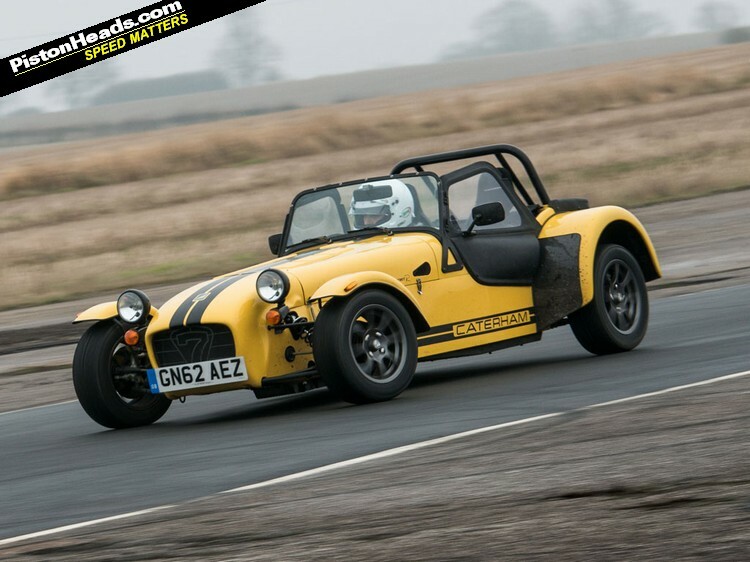 Forced induction takes the ragged edge off the power delivery, lulling you into a false sense of security that it's all OK when really it's anything but. I'm being very, very conservative and it's only really on the back straight where I dare let the shift lights go red before - BANG! - shifting up into fourth, dialling in the requisite opposite lock, and - POP! - into fifth for a moment before a sharp intake of breath and, bang, clonk, clang back down to second before it all starts again. 500hp per tonne shouldn't be this approachable, especially in these conditions, but somehow the R600 feels it. 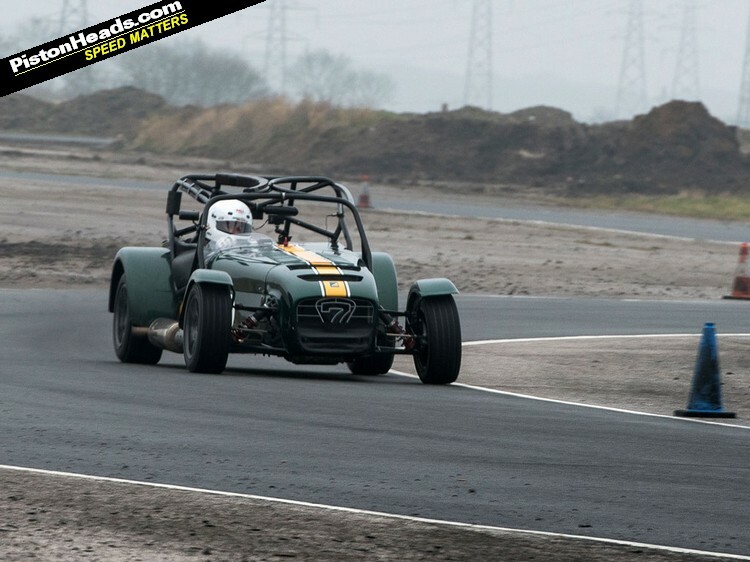 Which brings us back to going sideways in fifth on the return leg to Blyton's start/finish. Get ready with the corrective lock Trent! Reasoning I've got supercharged torque to lean on I try a lap short-shifting a gear up for some corners and, sure enough, this takes the edge off the savagery somewhat. 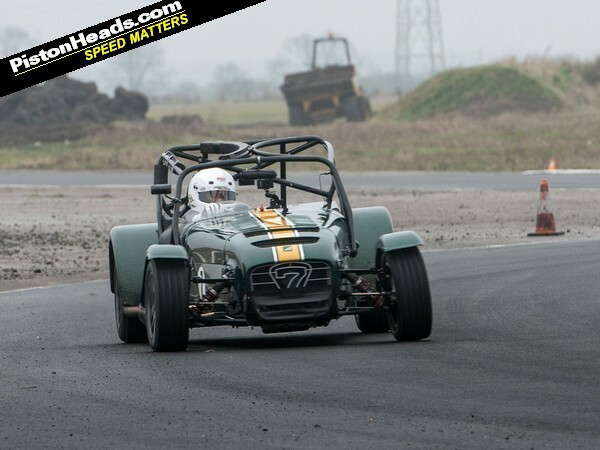 It's an appropriate compromise given the conditions and, if anything, feels even faster. And then the shift lights start glowing and the high rev insanity erupts once again. 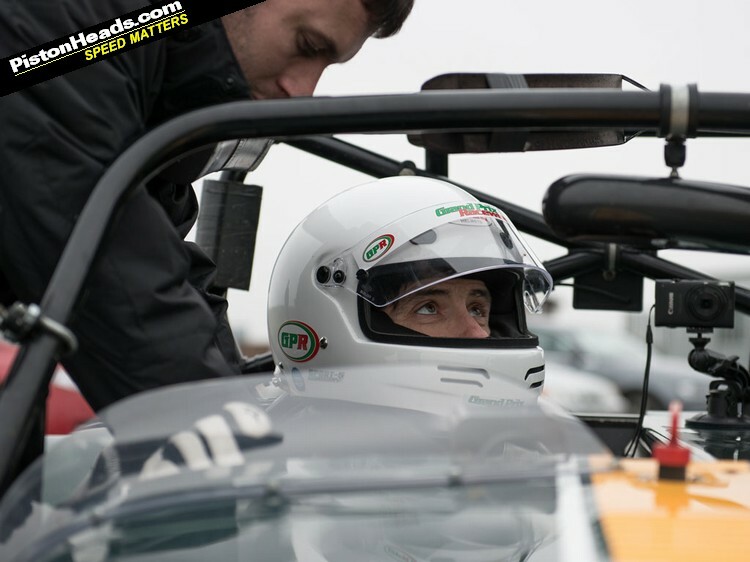 The Sadev box's software enables flat upshifts and if you do it when the lights are ablaze it throws you right back into the fright zone, ready to repeat if you've got the space and reactions to stay on top of it. So, will they ever make a road version? 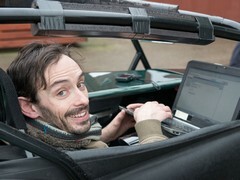 Marketing man James Drake pulls a face at the inevitable question. "We probably will do it eventually," he says, "but it's not on the radar at the moment. The first step is to prove it as a race car and develop it that way. But I'd be surprised if we didn't." 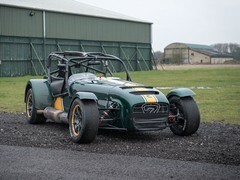 As it stands the supercharged engine isn't emissions ready and the new nose cone wouldn't pass the IVA test for fear of ingesting passing pedestrians (or somesuch bureaucratic nonsense) so for now a racing car it stays. 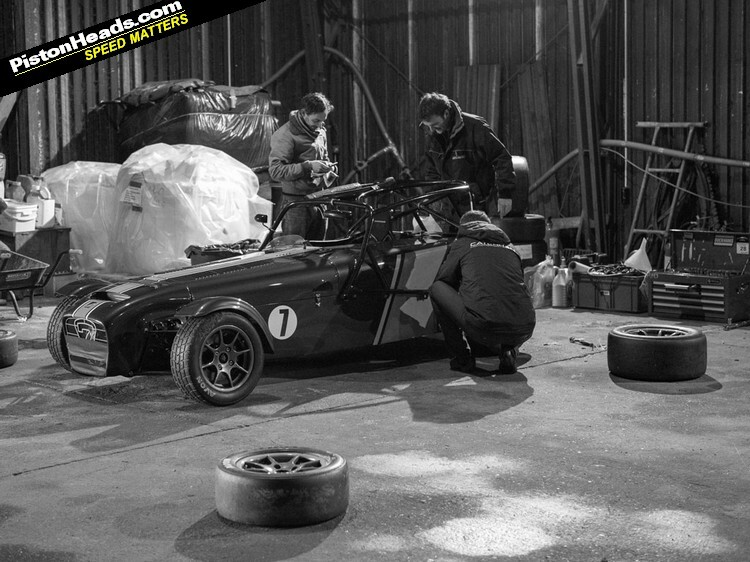 Having said that the development car Dale drove back in the summer was an adapted R300 road car so never say never. "And I lived to tell the tale too!" After two sessions, very little time with the wheels dead ahead and more close shaves than I've had in a decade of track driving it's a relief to roll to a halt, hit the kill switch and attempt to take in what just happened. 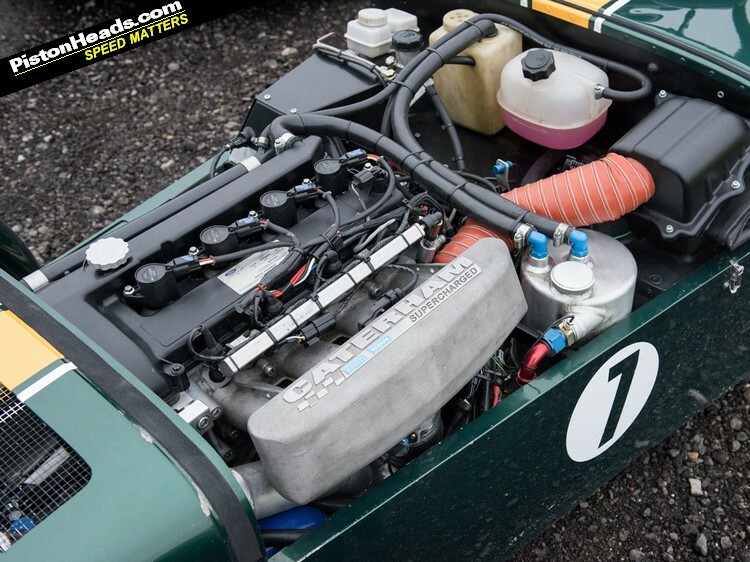 And giggle at the thought that they pegged it back to 275hp because that a seemed sensible compromise. Not language you'll hear associated with this car very often. 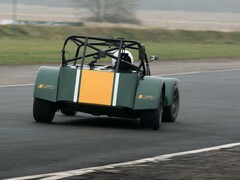 Onboard at Blyton- yes, the sound is awful and picture shaky but that at least offers an authentic taste of the experience! 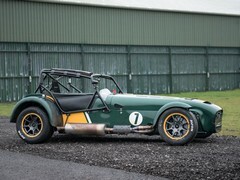 I LOVE this car, it will be like someone's brought back the old TVR Tuscan race series (admittedly without the soundtrack) when these things get let loose on British circuits! 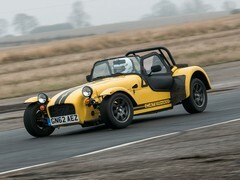 Bring on the road version with 335 bhp please - R700. Bonkers. Also, I'd like to add that Dan's driving is amongst the best I've ever seen from a PH scribe in the history of PH, I was expecting to see a timid plod around but that looked committed and lairy - brilliant! ps next time see if you can get some of Mr Harris's film budget so we can get some idea of noise etc. I don't believe the 550kg in the spec sheet though. Let's put one on the scales and see shall we? Well driven that man. Looks like epic fun. 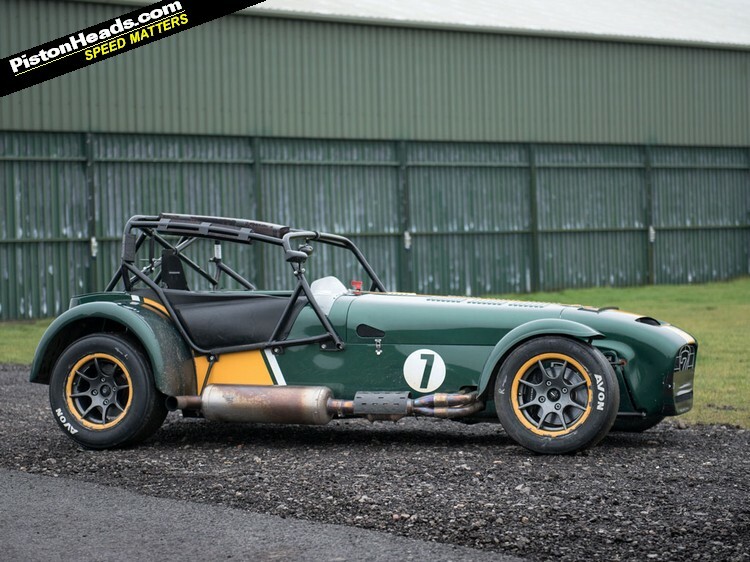 How hard would it be to convert one of these to a road legal spec?